Fishermen’s News Online Jul 25, 2016. Bristol Bay’s wild salmon harvest has reached upwards of 33 million fish, surpassing the harvest forecast of 29.52 million fish, and the preliminary commercial salmon harvest for Alaska statewide is climbing toward 64 million fish. Processors in Bristol Bay are offering a base price of 75 cents a pound, plus another 15 cents for salmon iced or in refrigerated seawater. “This run came in so picture perfect for the processors, you couldn’t have asked for better for the daily catch volume,” said Shawn Dochtermann, a veteran Bristol Bay harvester, aboard the F/V Isanotski at Egegik. After the long wait, the sockeyes have been arriving in the Bay at the rate of several thousand a day. The preliminary harvest breakdown through July 19 was 11.2 million fish for the Naknek-Kvichak District, 7.5 million fish each in the Nushagak and Egegik districts, 5.7 million fish in the Ugashik District, and 508,000 fish in the Togiak District. Harvests were also on the upswing statewide. On the Lower Yukon, small boat fishermen have delivered 521,000 chums and 109,000 humpies for processing. 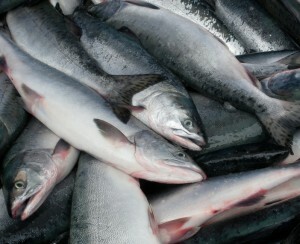 And in Cook Inlet processors have received more than 2 million salmon, including 1.7 million sockeyes. On the north side of the Alaska Peninsula, 2.7 million salmon have been harvested, while on the south side of the Peninsula, deliveries to processors have reached more than 5 million fish. In Chignik, the catch has reached over 1 million salmon, at Kodiak, upwards of 1.6 million fish, and in Southeast Alaska, 9 million fish.